He was also instrumental between the two World Wars for the village’s name being changed from Row to Rhu, the Gaelic for point, so it was pronounced correctly. He approached statutory bodies and other organisations, then held a referendum of villagers past and present to establish their views. Rhu emerged as the clear favourite, rather than Rhue. When he died on January 8 1971 at the age of 87, Rhu Parish Church was filled with 1,000 people for the funeral service for one of the village’s most respected and loved residents. Not long before his death, Dunbartonshire County Council agreed that a scheme of 28 houses nearing completion in Rhu should be named Barge Court. The Colonel had approved the name, but did not live to perform the opening ceremony. He often said with a smile that he could not claim a residential qualification in the village as he only arrived shortly before his first birthday. At various times he lived at Ardmoy, Artarman and latterly Armadale. 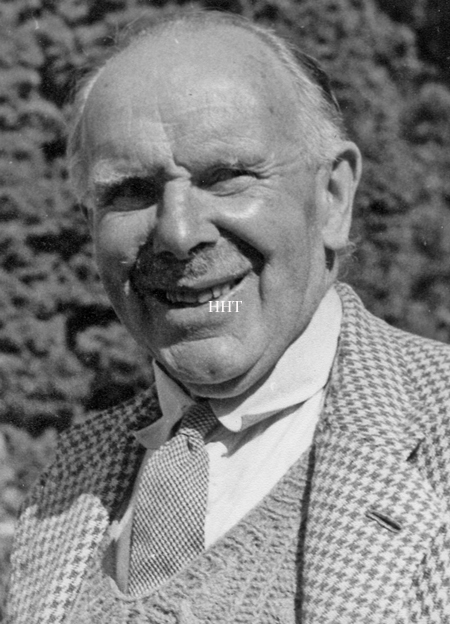 Born in Manchester in 1883, he was educated at Larchfield School in Helensburgh and Trinity College, Glenalmond, and graduated from Army Staff College. As a boy of six he saw the Training Ship Cumberland moored in the Gareloch consumed by fire. At the age of 11 he was a passenger on the first train to run on the West Highland Line. His overseas service began in South Africa in 1901 with the 3rd Battalion Argyll and Sutherland Highlanders, with whom he fought in the Boer War. He won the Queen’s Medal and two clasps before going to India in 1903 with the Cameronians. Two years later he joined the 17th Cavalry of the Indian Army, and he became a Bengal Lancer. That year he accepted a challenge to run a mile, walk a mile, ride a horse a mile, and ride a bicycle a mile, in less than 20 minutes. He managed it in 19 minutes 8 seconds. India made a great impression on him, so much so that seven years before his death he made a return pilgrimage to the North West Frontier. There he found the mess room of his old regiment still existed, with photographs of old comrades still hanging on the walls. Typically, even on the short visit, he became involved with the local people. To their surprise and delight he was able to solve a long-standing line demarcation problem — because he himself had actually taken part in the original survey. He was able to take local officials to the exact spot and show them what had been done at the time. 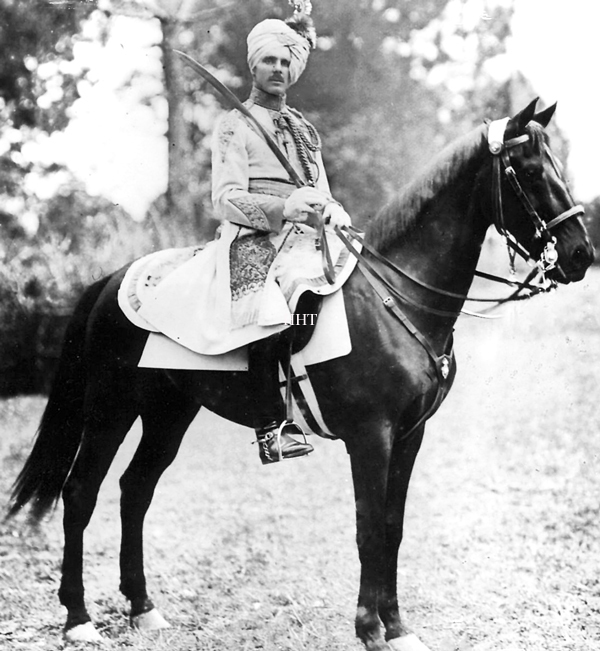 His Indian service ended during the First World War, and he was on active service in France throughout most of the war. He won the Military Cross and in 1918 the Distinguished Service Order, and he was three times Mentioned in Despatches. While serving in the Balkans at the end of the war he was awarded the Order of the Serbian White Eagle. 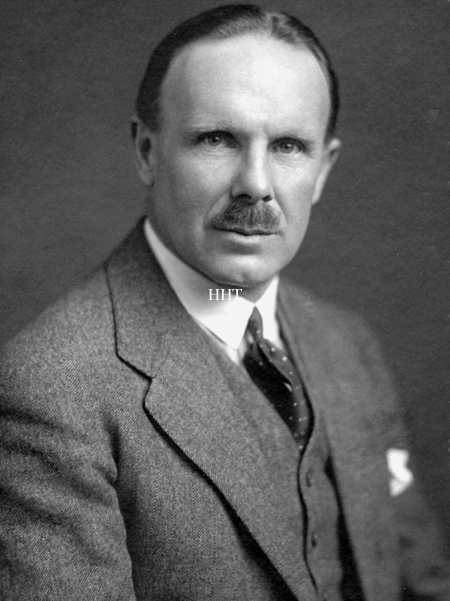 In 1915 he married Debonnaire Eva Ruth Mansfield, daughter of the late Major General Sir Herbert Mansfield, KCB, and in 1922 he retired from the army and — at the start of his forties — settled down in Rhu, taking over the family chemical business of Richard Smith Ltd. of Glasgow. He retired from business in 1963. As a cavalryman he was naturally a very keen horseman, and this interest spread to farming. He owned Evanachan Farm at Otter Ferry, Argyll, and even in his later years he drove there regularly to supervise and encourage the staff of the extremely modern farm. He was Rhu’s representative on Dunbartonshire County Council for 27 years and had tremendous influence in the preservation, but also modernisation, of the village. A Justice of the Peace, he was chairman of the County Licensing Court for over 15 years, and at the time of his death he was Senior Deputy Lieutenant of the County. During World War Two he was the instigator of the building by Royal Engineers of Auchengaich Reservoir above Glen Fruin. He insisted to the War Department that the existing water supplies could not cope with the demands of all the wartime bases in the area, and he persisted until the reservoir was built. As a result Rhu village was never short of water even when other places in the area were on severe rationing. Local organisations, particularly for youth, always received his full support. He was honorary chairman of Rhu Community Centre and at one time or another was connected with nearly every local group. An active worker for charity, he had a particular interest in the British Sailors Society childrens home at Lagarie, Rhu, and there in 1970 he was presented to Princess Alexandra. He was also associated with the Thistle Foundation which helps ex-servicemen. A member of the Queen’s Bodyguard for Scotland, the Royal Company of Archers, Colonel Barge was a keen shot and an enthusiastic sailor at, and even before, the then Royal Northern Yacht Club came to Rhu, and he became a Vice-Commodore and chairman of the house committee. He was one of the first to own a Gareloch One Design yacht, Thia, and raced in various other classes. A deeply religious man who was an elder of Rhu Parish Church for over 45 years and received a Long Service Certificate signed by the Moderator of the General Assembly, he put his religious principles in practice every day of the week. A friend paid this tribute: “In many ways, all Colonel Barge lived for was Rhu. He took a great personal interest in everybody in the village and was always ready to help or comfort. “His door was always open to anyone in need — and his grounds at Armadale were always open to the children of the village. “During World War Two he even threw open his billiard room, and the Rhu Scout Group set up their HQ there as normal premises were very hard to come by in wartime. He greatly enjoyed the pleasures of his garden, and shared them with others by opening the garden each summer under the Scotland’s Gardens Scheme. But unlike many others, he actively encouraged visitors to picnic in the grounds. In his later years he always remained available and helpful to his successors, and his advice was often sought. Colonel Barge died peacefully after a happy day during which he had been in good spirits and entertained friends. Predeceased by his wife in 1959, he was survived by his son Ronald, his daughter Lydia who looked after him, and a married daughter who lives in England. His other son, Lieutenant Robert Nigel Barge, was killed in action at Dunkirk on June 4 1940 at the age of 23, and is buried in Dunkirk Town Cemetery. An outstanding officer who was trained as a Royal Engineer, he came top of his class at Woolwich and helped to prepare and map defences around Dunkirk. He also assisted in repairing small craft to help his comrades escape. A licensed pilot, Nigel was a keen athlete who ran for Maryhill Harriers, of which his father was a committee member. To this day the Harriers still stage the Nigel Barge Road Race, first held in 1943, in his memory. The 2013 event is at Garscube on Saturday March 23. In June 2014 John McAllan, who has lived for nearly 60 years in Dartmouth, Nova Scotia, Canada, sent this tribute to the Heritage Trust website . . .
My mother worked for Colonel Barge as a cook and I spent some very wonderful years at Armadale. The first picture in this article is the Colonel as I remember him. What a dynamic man — if we all had half his energy and drive the world would be a better place. I remember, as a 12 year-old, running down Armadale drive to catch the bus for school. Inevitably I would run into the Colonel. "Good morning John," he would say. "Did you brush your teeth this morning," I couldn't look that man in the eye and tell a lie, and if the answer was no, then that's what came out. "Back you go," he would say. "But I'll miss the bus sir," I would reply. "Should have thought of that then, shouldn't you?" he would say. This is probably why at 78 I have a great set of teeth, but was not so successful at Hermitage Secondary School. There was always something to do when the Colonel was around. I remember helping to build an incubator for chickens, also a huge chicken house at the back of Armadale. Feeding the hens was my job. Feeding the two Labradors, Tess and Sue, that was also my job. "Come on, John," he would say, "we are going sailing". He had arguably the best Dragon yacht at the Royal Northern Yacht Club, Zorsay, which apparently is Hindu for 'Flight.' I might add that we won most of the races. When he was grouse shooting, inevitably I was shackled in to be one of the beaters. He was a generous man though, any work he had this young lad do he gave fair compensation. Many times he would say "Come on John, get in the car I'm going to Glasgow, or Garelochhead, or somewhere." This was always an adventure, although on looking back, driving was not one of his better accomplishments — I remember nearly coming a cropper near Gully Bridge. As the son of a servant I led a most wonderful life at Armadale. That first picture of the Colonel in an instant took me back 66 years. Images from 1965, 1938, and 1910 as a Bengal Lancer, kindly supplied to Helensburgh Heritage Trust by Nigel Barge, son of Ronald and grandson of the Colonel.